Richard Young admits that this week's magnitude 6.9 earthquake off the Northern California coast made him sit up in bed. This one did not produce a menacing tsunami. But if it had, the Crescent City harbormaster says he'd be ready. Three years ago -- almost to the day -- a wave generated by Japan's monstrous Tohoku earthquake destroyed Crescent City's fishing harbor. "It was devastating," recalls Young, "not only for the harbor but for the entire community up here because this harbor and the commercial fishing activity that takes place here is an enormous part of the local economy, the local identity, and we were at risk of losing all of it at that time." Three years and $50 million later, Young says, "It's fair to say we're all the way back at this point." The harbor has been rebuilt with new slips and gangways, and a new feature that may be most important of all. "It's the first tsunami-resistant marina that we know of anywhere on the West Coast," Young adds with pride. "When we rebuilt it, we built it much stronger than it was previously. There are more pilings, larger pilings, and the system is designed to resist up to a 50-year tsunami." 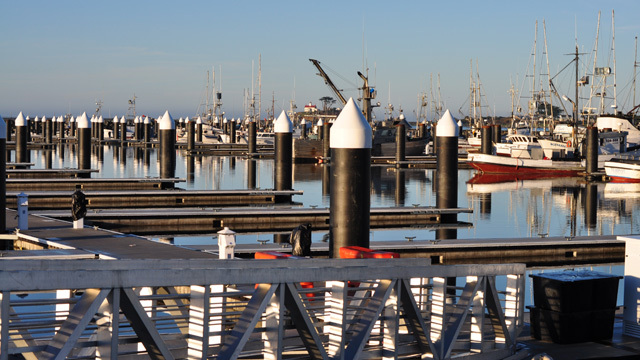 Designed by Oakland-based Ben C. Gerwick Inc., the fishing port has added nearly 100 more pilings (the posts that hold the floating docks in place). The new pilings are double the size of the old ones, and driven 30 feet into bedrock under the harbor. But the key new feature is a 400-foot tsunami attenuator dock, designed to withstand a tsunami of the intensity typically seen only twice in a century. Young says that translates roughly to a 12 to 15-foot wave. "Nothing is tsunami-proof because obviously we can't resist all the forces that Mother Nature can throw at us," admits Young, but, in a repeat of the type of events that caused havoc in 2006 and 2011, "This harbor is designed to resist those forces and suffer minimal, if any damage at all." Young says that it's been a long road back. He and his staff had just lined up redevelopment plans from a 2006 event, when the larger 2011 wave struck." Where the 2006 tsunami damaged things, the 2011 tsunami just destroyed the harbor," he recalls. "We're very happy to get back to the business of running a harbor, instead of building a harbor." 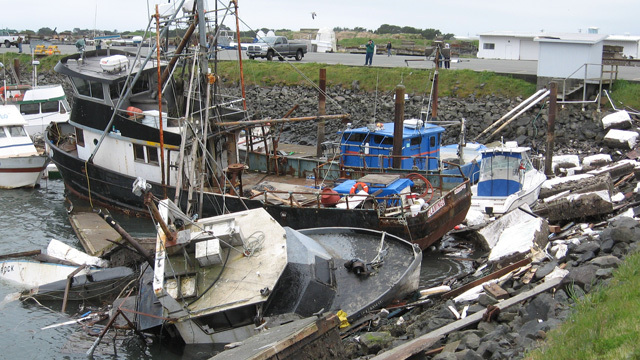 Most of the money to rebuild the harbor came from state and federal disaster grants, with some help from Del Norte County. But the harbor still had to borrow $5 million to finish the job. "Now comes the hard part, which is paying the bills," says Young. The hard part is over for Young, however. He says he delayed his retirement in order to stick around and get the job done. Now he's hanging up his slicker and moving to Chico in the Sierra foothills, where he is unlikely to hear tsunami warning sirens in the night.